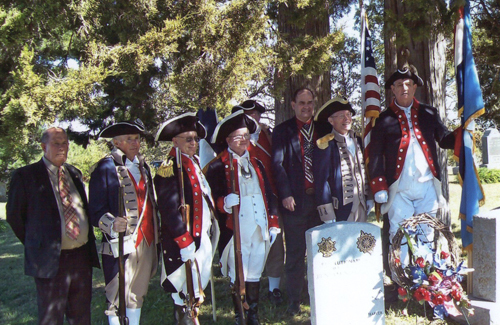 Pictured here is the MOSSAR Color Guard team, along with MOSSAR State President Clifford Olsen, participating with the Thomas Hart Benton DAR Chapter, at the Patriot Benjamin Proctor Memorial, located at Union/William Cemetery, Cole Camp in Benton County, Missouri on Sunday, October 3, 2010. LeftPhoto (L-R): Brigadier General Russell F. DeVenney, Compatriot Wayne Merrill, Compatriot Bragg Stanley, Compatriot Jesse Lybarger, MOSSAR State President Clifford Olsen, Compatriot Al Paris, and Captain James Scott. Right Photo (L-R): ??? 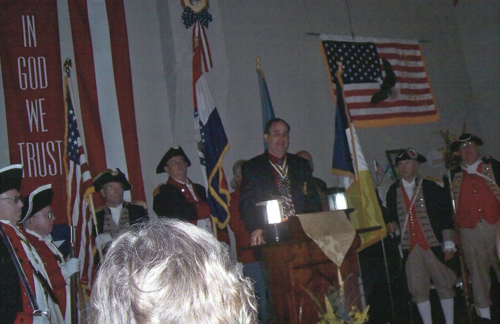 Compatriot Al Paris; Brigadier General Russell F. DeVenney, Compatriot Wayne Merrill, Captain James Scott, MOSSAR State President Clifford Olsen, Compatriot Bragg Stanley, and Compatriot Jesse Lybarger.